At first, I found the opportunity to test and pick your writer quite inviting, but having to pay extra $10 just to test a writer was a bit too much, especially since the target audience of Clazwork.com are students. Many companies will choose the most suitable writer at no additional fee, but since this company promised low prices for papers, I decided to give it a go. 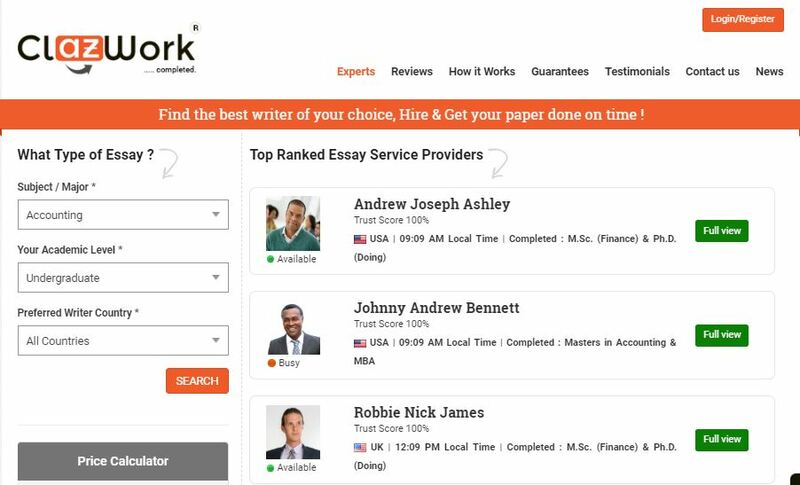 Unfortunately, Clazwork is not one of those companies that write all your papers for you. This service offers only essays. If you look into their list of essay types, you will find options for almost every subject there is, but being limited to essays only is a bit of a disadvantage for students looking for a regular content provider. Prices depend on the writer you choose. You can choose between dozen of writers, all of which have different qualifications and things to offer. Some writers offer four free revisions, while others offer only one. Some will charge you a low fee for the paper and other will charge a fortune. Basically, you pay for what you choose. Once again, the free features will depend on the writer of your choice and what you agree with the writer. Seeing that this company has a bidding approach, do not expect any discounts. They cannot and do not offer discounts to new or returning customers, which is a huge disadvantage when compared to other services. The ordering process is made simple, but I find it to be time-consuming. Having to go through all the writers in the list is exhausting and very risky, so you must take your time with this step. And since the qualifications presented are not really a proof of the quality of paper, the company recommends paying extra $10 to check the writer’s quality of writing. This is an unnecessary, additional expense many students try to avoid. My communication with the writer was good, but I got the feeling that his name isn’t really ‘Jason Jackson’. Why? Because his English was relatively good, but did not sound like a native English speaker. He made some serious mistakes while conversing with me, even though he was very pleasant to speak to. The work was delivered within the set deadline, so I had no complaints there. The writer kept me in the loop about the progress of the paper at all times and listened to my requirements while writing it. Unfortunately, the paper I got was of relatively bad quality. Even though the writer was communicative and made it to our deadline, we noticed the same concerning mistakes in the content, too. The paper was not properly edited and proofread, and contained an incredibly large amount of mistakes. Many of the sentences were even incomprehensible. Overall, I found three major disadvantages when it comes to Clazwork.com: time-consuming process, low quality content and limited list of services.